Ryan Miller. The goaltender for the Buffalo Sabres! A true hero in our town! I composed this oil painting on my Christmas break. I was also working on other commissioned drawings while I was working on this project, so i had to take time off to finish it, but I did finish it within the time frame projected! This is my first realistic-type painting, however the painting is painted heavily with many brushstrokes and there is alot of color blended to create other colors. I used silver oil paint that cost me a little more than $25.00 for a small tube. It contains aluminum, so it was very expensive. 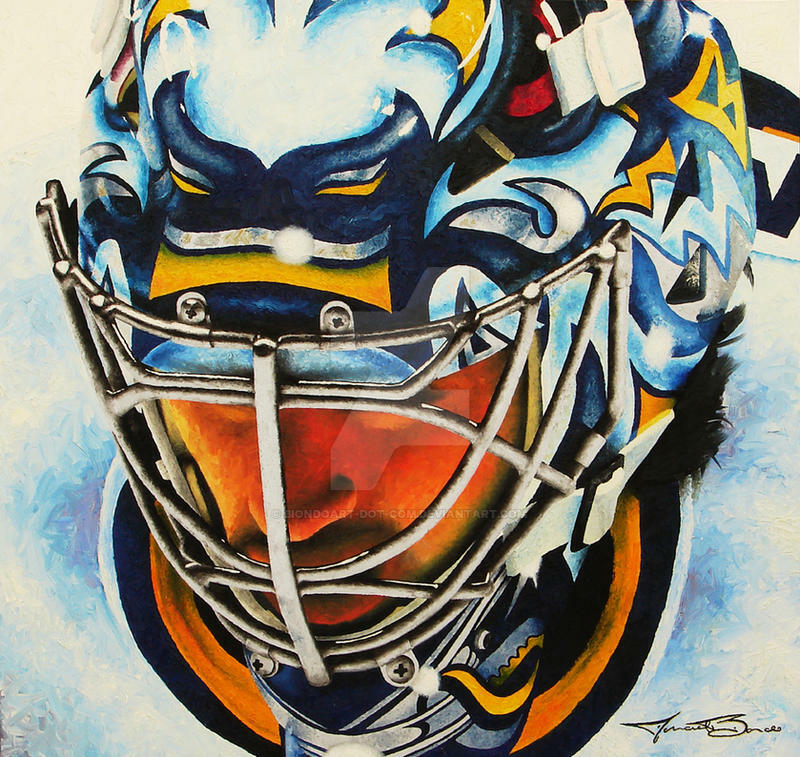 You can also check out the feature on Ryan Miller's Website, [link] with my painting in the Lifestyles section [link] This website is hosted through NHL.com, so I was very excited to see that my artwork made it such a long way, especially to help a good cause! 2008. Oil Painting. 48" x 50"
Very sorry, I just realised I never came over to check out your finished piece! Great painting...I bow down...I'm comfortable with pencils but paint is still a skill I'm yet to master. I also have an updated Miller drawing in the pipeline...ready for the Playoffs tonight? I'm SO excited. Let's hope Miller takes care of business. Wow! This is quite gorgeous, I love the colours!!!! the scale of it is fantastic. is it oil alone or other mediums? either way, it's great. thank you! it is only oil Paint! Thanks again! That's really wonderful to hear! Thank you for all of your kind words! I just recently found out that this piece is featured on Ryan Miller's Website, hosted through NHL.com! I was really excited to see that! 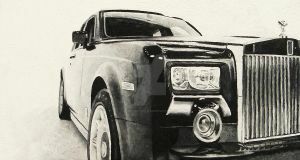 I will update the artists comments, but If you want to check it out, you can goto Millertime30.com and check out the Lifestyles section... you can read a little bit about what we plan to use the artwork to benefit his Mission for the Steadfast Foundation! Thank you once again! I Greatly appreciate it! You're quite welcome; they're only fitting since I love your painting so very much. And congrats on the feature! That's quite an honor, and I'll be sure to check out the site. Thanks hun! So glad we got him that contract! I'm a Bruins fan but this is awesome work! Well thank you! The Sabres just tried to pick up our own Chara, with a 6'7" defensemen! Good luck to you guys next season, but I will always say "Go Sabres!" Ha, nice. And good luck to you too . Thank you! That is much apprecited! I love this so much! Definitely my desktop wallpaper now as well! haha! Yea! That's really cool of you! Much appreciated! Hey, thanks for the comments on my Miller drawing! Haven't logged in for a LONG time so apologies for the delay replying! I think your painting is incredible, I am okay with a brush but no where near as accomplished as you! 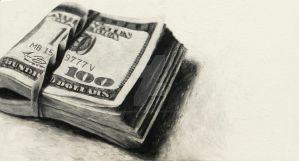 Great piece...do you ever sell you work or do commissions? Thank you so much! And your welcome! Your Miller drawing is very good! I do commissions for anybody who wants something... if they cannot afford and original then I always encourage canvas prints! I hope that all is well! If you are interested in anything, then please send me a note! Thanks! Thank you!!! That is another great compliment! I think his mask did look really cool with the black red and silver as well, but either way his design on his mask is one of the sickest that I've ever seen! Just remember that MONTREAL HABS ARE NUMBER 1 TEAM OF ALL TIME! I''m sorry to say... DEFINITELY NOT!!! The Sabe's have more goals for! I can't wait to play you guys in April! Hopefully Montreal will go easy on the Sabes. I'll come back to you on this! Have a great Easter!! WAAAA Ryan Miller COOL! just perfectly awesome! Good luck to the Sabers to make it to the playoffs! Thanks!!! I hope that we make it as well... what a great game last night against the Lightning... 6 GOALS IN THE 3RD PERIOD!!! Soo nasty! yes that was @ a practice. i'm from buffalo but i don't live there anymore. 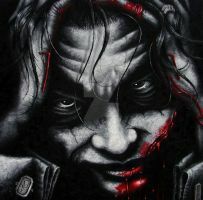 this painting is AMAZING!!! YEAH! Buffalo baby! I'm proud to say that I am from here, but I hate the weather!! Thank you so much for the compliment! looks pretty dang good, i can't do anything with oil paints. Good work! GREAT Miller pic! I love it! I may be a Blackhawks fan, but I do have my favorites in the NHL, Miller's one of them (the other would be Sidney Crosby...just don't tell my fiance that! ...he hates the Penguins... ). HAHA! I love your quote dude! That's classic! I love that commercial! Anyways, thank you for that compliment! You also have to thank Buffalo for creating Patrick Kane! He's a great hockey player! I met him one time, he is family friends with one of my friends! I think that Blackhawks are a good team! but I love the Sabres! I just recently met Ryan & his father at the Catwalk for Charity! I have pictures of facebook. Ryan is going to sell this print through his Steadfast Foundation website! I'm real excited about that!!!! I will post a journal about it all and post my pix on myspace so everyone can see them! Check back if you are interested! They are great pictures! LOL! That's the BEST commercial EVER! LOL! It never gets old to me! I put it up on my and my fiance's MySpace! LOL! Something about two goalies trading "yo mama" jokes is pure genius! Anyways, you're very welcome! And you're right about Kane! We lucked out with that kid (he has some CRAZY skill! Have you SEEN some of his shoot-out goals?! O.o ). I thought it was so sweet that in our game vs. the Sabres, Pat Kane's grandfather was out there on the ice! I'm a Blackhawks fan (due to my fiance and his dad), but I also like other teams too (just don't tell my fiance! ). LOL! I once said that I liked Sidney Crosby 'cause he's a great player (he IS!) and my fiance told me not to be a traitor. Anyhoos, I like the Sabres and Miller (I particulary liked that little beanie-hat Miller wore on top of his goalie mask during the Winter Classic. That was cute! ....I'm such a girl! )! The Sabres are a great team too! (The 'Hawks are great...we just have some problems right about now... ). Either way, before I talk your ear off, I'll be more than happy to see those pics and such when you get them posted! That would be SWEET! Huzzah from a fellow hockey fan! I also just uploaded a bunch of photos, check out my blog, and even comment on it if you can! He's been a Sabres fan for a long time, ya know? That's what the announcers were saying before that game. They had like, a MILLION interviews with him about "coming home to Buffalo". It was cute. Personally, I'm just thrilled that the Hawks have ended their losing streak! Supposedly, we're getting Toews back tomorrow...I can't wait. Seeing Toews and Kane on the ice together is like magic. I mean, out here in Chicago it's said that Kane and Toews have given the Blackhawks franchise the shot in the arm that it needed (which is true)! Anyhoos, LOVED the pics you had on your MySpace! (would I be a "stalker" if I added you as a friend?! ). It REALLY looked like SO much fun! I wish I was there! I know Toews & Kane are so sick together! They really know how to play hockey! Great chemisty! They really did give a lot of life to the Blackhawks! You guys are pretty deadly. I, personnaly, think that if they make it to the playoffs this season, they will take it real far! I think that they have a lot of determination in that team. I would actually love it if you added me as a friend on myspace and kept in touch with me! I love to meet new people, so the more friends the merrier!!! 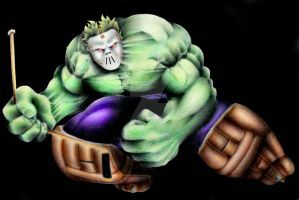 so add me as a friend and send me a message saying you are Bugsytrex from deviant art, so i know who you are!